Published: March 28, 2014 at 04:11 p.m. 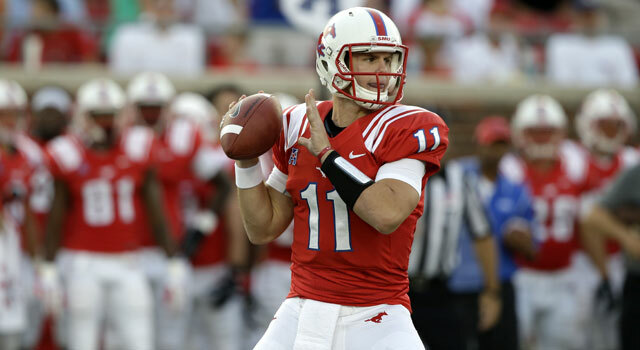 Updated: April 9, 2014 at 12:11 p.m.
QB Garrett Gilbert turned in a strong performance during SMU's pro day on Friday. DALLAS -- Sometimes, even this deep into the NFL draft process, a prospect rises from seemingly out of nowhere. For me, that prospect this year is SMU quarterback Garrett Gilbert. Now, I liked Gilbert before his pro day on Friday at SMU -- thought he was an underrated player who should have been invited to the NFL Scouting Combine in February. But his pro-day performance confirmed my thoughts. In front of three NFL quarterback coaches (Bill Musgrave of the Eagles, Wade Wilson of the Cowboys and the Ravens' Rick Dennison) and representatives from 22 different NFL teams, Garrett completed 87 of 88 passes, and would have completed them all if he had Calvin Johnson catching the back-shoulder fade that hit the ground. He looks like a bigger version of his father Gale, who played 11 seasons in the NFL (Gale remains the only player to play on five straight Super Bowl teams) with the Seahawks, Bills and Chargers. Garrett Gilbert measured 6-foot-3 7/8 on Friday and weighed 221 pounds. He ran the 40 in 4.81 and 4.83 seconds, had a 29.5-inch vertical jump, a 9-foot-9 broad jump, ran the short shuttle in 4.43 seconds and the three-cone drill in 7.30 seconds. It was a performance that will get him a lot of attention between now and the draft. Gilbert told me he has visits lined up already with the Panthers and Buccaneers. Expect that list to grow. 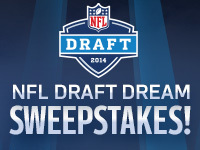 When all is said and done, I think he'll end up being a mid-round draft pick, maybe even as early as the third round. One NFL scout at the workout, who was also at Brett Smith's pro day at Wyoming two weeks ago, told me he views Gilbert as a much better prospect than Smith. Many people thought Smith should have been invited to the combine. Speaking of the combine, I thought Gilbert's workout was better than half of those who were in Indianapolis last month. He has good accuracy, very good velocity, and is a great athlete with NFL size. » 1. Despite not having a whole lot to work with at SMU, he had success. Only three other quarterbacks in the nation averaged more passing yards last year than him (one of them was Fresno State's Derek Carr), and in one five-game stretch in the second half of the season he threw for more than 2,000 yards and totaled 17 touchdowns with just one interception. He missed the final two games with a knee injury. » 2. Gilbert was a five-star recruit at Texas, where he had a lackluster career, to say the least. He graduated in three years and transferred to SMU in 2012, hoping to resurrect his career under June Jones. There might not be a better quarterbacks coach than Jones, who has played or coached the position in college and the NFL since 1971. Thanks to Jones, Gilbert is a different quarterback than he was at Texas, and Jones believes he'll only get better in the NFL. I think so, too. He'll surprise people with where some team takes him in the draft, and he'll surprise even more with his NFL production.